Herbert Giesbrecht: teacher, archivist and librarian; born 5 August 1925 in Wohldemfürst, Kuban Mennonite Settlement, South Russia, to Jacob J. Giesbrecht (18 May 1896 – 5 February 1980) and Katharina (Harder) Giesbrecht (11 August 1903 – 9 February 1980). He was the eldest of six children in the family. On 11 September 1954, he married Margaret Martens in Vineland, Ontario, Canada. The couple had four sons. Herb died of cancer on 12 January 1992 in Winnipeg. The Giesbrechts immigrated to Canada in 1926, settling in Saskatoon, Saskatchewan. The family moved to Yarrow, British Columbia in 1933 to work on a relative’s farm. The next move was to a rabbit farm in Laidlaw, and in 1938, the family moved to Vancouver, where Herbert finished high school before starting classes at the University of British Columbia. His first year was interrupted by an accident, but he eventually returned to his studies to become a teacher. Herbert was baptized and joined the Vancouver Mennonite Brethren (MB) Church on 18 June 1944. After completing his studies, Herbert taught in Coquitlam and Burns Lake before moving to the Jericho Beach School for the Blind and Deaf. During the summers, he studied for his Master’s degree in Special Education in San Francisco, California. In 1953, he moved to Manitoba to begin theological studies at the Mennonite Brethren Bible College (MBBC) in Winnipeg. While he was taking classes towards his Bachelor of Theology, Herb met Margaret Martens, who was also studying at the MBBC. They married on 11 September 1954 in Vineland, Ontario, before returning to Winnipeg to complete their studies. Herb obtained a position as the college librarian and English instructor at MBBC, and he remained there until his retirement in 1990, 35 years later. Throughout the years, Giesbrecht continued to study, earning a Master’s in Library Sciences from the University of Minnesota and a Master’s in English Literature from the University of Manitoba, as well as continuing to study theology on his own. In 1969, he became the first (part-time) archivist for the Canadian Conference of Mennonite Brethren Churches, and the next year, he was ordained in the Elmwood Mennonite Brethren Church in Winnipeg. Herb served as secretary for the college faculty meetings, as well as in the church and the provincial conference. He helped edit several books and translated the texts from German into English, as well as making regular contributions to The Voice, the Mennonite Brethren Bible College paper. 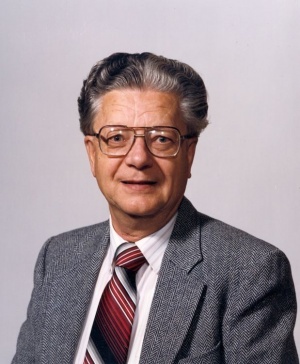 In 1990, Giesbrecht retired from his position as librarian at the Mennonite Brethren Bible College. In fall 1991 he and Margaret began a term of service at the Mennonite Central Committee office in Akron, Pennsylvania, USA. During this time, Herb became ill with cancer and the couple returned to Manitoba, where he died on 12 January 1992 in Winnipeg. The funeral was held on 16 January at the Elmwood MB Church. Herbert Giesbrecht was a dedicated archivist, librarian, and editor whose love for God and enthusiasm for his work showed in everything he did. Through his commitment to family and friends, his sense of humor, and his service in church and conference organizations, Herb was an example of dedication for his family and the community to follow. Ewert, David. “A Tribute to a Colleague.” Mennonite Brethren Herald (6 March 1992): 28. GRANDMA (The Genealogical Registry and Database of Mennonite Ancestry) Database, 6.02 ed. Fresno, CA: California Mennonite Historical Society, 2010: #410413. Mennonite Brethren Herald (6 March 1992): 29. Mennonitische Rundschau (11 March 1992): 26. Reddig, Ken. “MB Archives Moved.” Mennonite Historian (September 1979): 3. Huebert, Susan. "Giesbrecht, Herbert (1925-1992)." Global Anabaptist Mennonite Encyclopedia Online. February 2010. Web. 18 Apr 2019. http://gameo.org/index.php?title=Giesbrecht,_Herbert_(1925-1992)&oldid=142750. Huebert, Susan. (February 2010). Giesbrecht, Herbert (1925-1992). Global Anabaptist Mennonite Encyclopedia Online. Retrieved 18 April 2019, from http://gameo.org/index.php?title=Giesbrecht,_Herbert_(1925-1992)&oldid=142750. This page was last modified on 8 January 2017, at 17:18.